Running a business is a bit like surfing; you have to ride the waves as they hit or risk going under. This is especially true when it comes to navigating market forces. Flexible, dynamic and unpredictable markets have the power to swiftly impact your business. Remember record stores? There was a time when it was hard to imagine a town centre without an HMV or Virgin Megastore, but now they’re a rare sight. For both businesses, the market changed to a degree which meant they simply couldn’t survive in their previous form. From fierce competition and technological innovation, market changes can be a barrier to growth. How do you know if your market is on a downward trajectory? 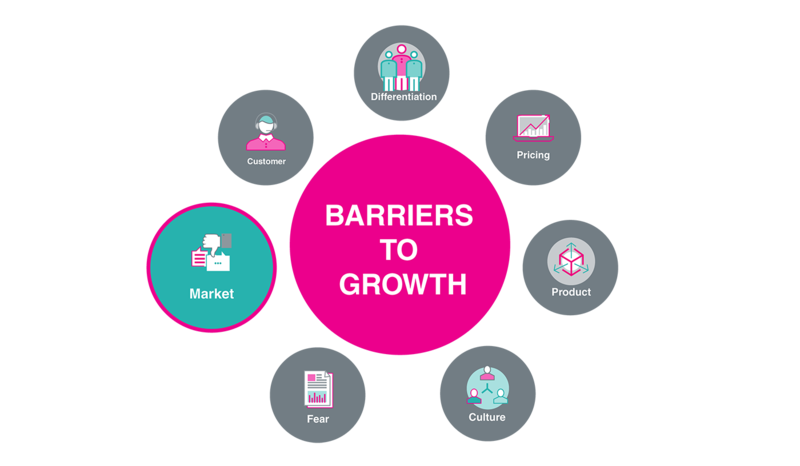 And how can marketing help you break through the barrier? While some market changes are as subtle as a rhino in a wine bar, others are more insidious. Revolutionary tech like the iPhone and innovative new business ideas such as Uber are obvious market disruptors. They change the landscape and force competitors to innovate or perish. A weakening market can be less easy to spot. The shift is creeping, not explosive, and the symptoms of change can be mistaken for other barriers to business growth. When determining whether a receding market is affecting your business, there are clear signs to look for. The overall picture is one of decline. Sales drop, regular customers stop purchasing for no obvious reason, conversion rates dwindle, prices in your market drop and profit margins disappear when you try to match competitors’ prices. Coupled with other tell-tale signs – a dearth of new customers and a lack of innovation – then the chances are that you’re in a declining market and it’s affecting your business. Fail to react and your company will drift downwards and eventually reach a point of no-return. Lower sales will quickly lead to excess capacity and higher inventory levels. Prices will have to be cut, profitability will diminish, cashflow will vanish and the downward trajectory will continue unless the market miraculously takes a turn upwards. Blindly carrying on is not a viable option. Although a diminishing market may seem insurmountable, decisive measures can be taken to limit the damage, help you take control and ultimately break through the barrier. Shift your mindset. Accept that changes must be implemented to achieve growth. Try to view these changes as an opportunity, rather than a problem. It’s important to realise that doing nothing is not an option. A great book that we’d recommend reading is Who Moved My Cheese. In the book, cheese is a metaphor for life and the book details in an entertaining way how you can anticipate, adapt to and enjoy change and be ready change quickly whenever you need to. Instead of focussing on what’s been lost, focus on what you still have. Work hard to keep customers by increasing retention activity. Add a personal touch to your customer interactions, improve response times and give customers an opportunity to offer feedback through surveys or questionnaires. One of the businesses we worked with made significant changes to their ordering system to improve ease-of-use for their customers. By adding value to their product in this way, they increased customer satisfaction and, ultimately, improved retention rates. Ask yourself: what do your clients value? What are they truly trying to achieve? Are they purchasing packaging? Do they want to make an impact by becoming more ethical or eco-friendly? Knowing what they want is the first step towards finding a solution. Find out what works. Every penny used on marketing and other business activity must represent money well-spent. Measure ROI of your sales and marketing operations to determine what you should continue doing and what you should stop. Once you’ve covered these areas, it’s time to think strategically to make significant changes. While innovation can mean developing new products or services, it also encompasses how companies do business and deliver their products. If your product is simply no longer in demand, it’s time to diversify and create new products for different markets. Products that are still selling may require new features to add value, such as improved accessibility or usability. Review the competitors in your market and see how they’ve innovated, or not. What can you learn from them? How can you empower your customers, or make life more convenient for them? This approach is about managing what you already have: adjusting your business model to fit the new market landscape and being focused on boosting productivity. Begin by re-evaluating your quarterly and annual forecast to bring it in-line with the status quo, as opposed to where the market was a year ago. An inflated forecast will only lead to a sense of failure. Think about your marketing activity. Which channels do you currently use? Switching to lower cost marketing streams is an effective way to reduce spend, with many options available. If you pay excessive amounts on advertising, consider focusing instead on social media and other online channels. Review your suppliers. Have you been using the same ones for years? Are there more competitively priced companies you could switch to? Often businesses stay with the same suppliers because they’ve developed strong relationships or simply out of habit. If this is costing your business more than it needs to, it’s time to change. Maintaining your business in an adverse or diminishing market comes down largely to whether or not you can increase productivity and make the best of what you’ve got. As such, it’s important to ask the right questions. Is your tech up-to-scratch? Web-based technologies can make a dramatic difference to efficiency and productivity. If you’re using antiquated systems or wasting time inputting or searching for data, think about how you can update your tech to streamline processes and save time and money. What would your business look like to a potential investor? Answering this question will help identify inefficiencies and cut waste from your marketing strategy. What is the vision and objective of your business? Do the marketing processes in place add value and meet those objectives? What are your business’ strengths and weaknesses? You must establish what needs to be improved in your organisation before you can do something about it. Focus on one or two areas at a time. Trying to change too many things at once will be difficult to implement and harder to measure. Find the positives in your marketing activity. Have there been any standout accomplishments? Even the smallest improvements can multiply and grow. Use metrics. If you don’t measure your results, you won’t know how effective your changes have been. A stagnating market can present attractive opportunities for businesses able to withstand the pressure. If you feel the market (or different version of the current market) will grow in the future, seeking to become the ‘big fish’ can help your business take the position of market-leader. This approach is most effective if demand still exists but no new offerings are being introduced into the marketplace. Essentially, customers exist but have nowhere to go. How do you capture them? The most obvious method is by aggressively targeting your competitors’ customers. Offer competitive prices, reward incentives or better customer service to attract them to your business. Set yourself apart from others. Why is your brand better, more attractive, more exciting? Differentiating yourself from competitors can be an effective way of telling customers that you are a better choice of partner of their business. To do this, ask yourself: what’s unique about your brand? What distinguishes you from your competition? Use your answers to create bold, targeted marketing campaigns that help regain market share. Make sure the whole business is singing from the same hymn sheet, so that everyone knows the USPs and communicates them to your customers. A good sign this is working is when your competitors start to copy you. If you opt for this strategy, an important area to consider is investment in new products or innovative processes. While others are struggling to survive, expanding or improving your output raises competitors’ costs to stay in business. Turning up the heat on the competition in this way increases your chances of becoming the market leader. As the market diminishes, there may also be acquisition opportunities. Purchases made in declining markets will pay dividends if and when the market recovers. This strategy is about finding a niche in your industry and re-positioning your business to focus on it exclusively. Once you’ve established which segment of your market is continuing to offer demand, significantly restructure your company to meet the needs of this niche market. While this research takes time and effort, cost-savings can be made in more targeted marketing activity. This approach is all about focussing aggressively on one area of the market where you can have a dominant share, and not worrying too much about the other companies you used to compete with. There may be other ways in which you can reposition your brand, depending on your sector. Could you launch a new product or sub-brand? Or reposition your business as a luxury brand? Growing a business in a declining market is a significant accomplishment, but not an impossible one. Doing so can even make organisations stronger and more profitable than they were previously. The processes teams put in place on these occasions – such as measuring marketing ROI and improving productivity – are not just useful in a declining market, however. They should be ongoing activities for businesses in any industry and any economic climate. An American senator famously said ‘To the victor belong the spoils’. And so in business. Those that survive hardship usually come away stronger and more resilient than before. By focusing on what works, removing what doesn’t and working hard to retain customers, businesses can turn a declining market into an opportunity for growth. React swiftly to ride the wave and avoid being swallowed by the surf.